Have you ever seen a girl eating her own hair??? 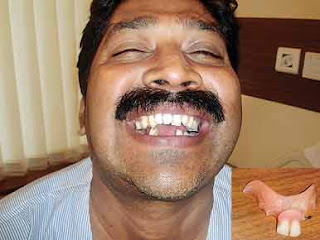 A 45-year-old hotelier was admitted to SevenHills Hospital, Andheri (E), after he accidentally swallowed his dentures (two false teeth) while drinking water. What is surprising is that the dentures were stuck in his voice box for more than 12 hours. "Taranath Adppa came to us with a pain in his throat and breathing trouble. His relatives told us about the dentures getting stuck,” ENT consultant at SevenHills Hospital, Dr Ashwini Kumar Mehta said. The Palghar resident was first taken to a local doctor where the initial tests were conducted. Adppa’s relatives were then asked to take him to a multispecialty hospital saying he will need to be operated on immediately. "On Monday, Adppa was taking his pills for diabetes when he swallowed the dentures by mistake. A laryngoscopy confirmed that there was a foreign object stuck in the throat area. An X-ray showed that they were his dentures,” Dr Mehta said. Doctors were able to take the dentures out after the laryngoscopy, which showed them to its exact position. If he made dental implant then this never happened to him.But, anyhow he survived and this is a great news for him and his family.